Only single keystrokes on clearly labeled keys are required to enter all of the parameters into the Model 5000 Phase Standard. A large bright display shows Phase, Frequency and both output Amplitudes at all times. 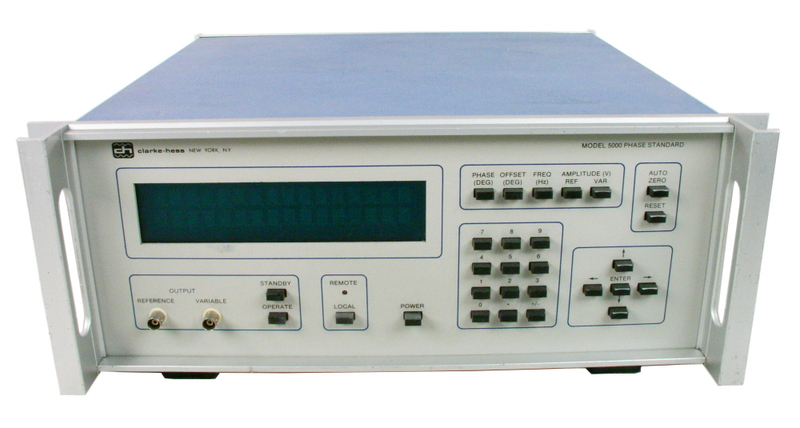 The combination of excellent phase accuracy, excellent amplitude accuracy and low distortion from each channel make the Model 5000 Phase Standard ideal for calibrating Phase Meters, Vector Voltmeters, Broadband Wattmeters and Power Analyzers, Resolvers and other Phase Sensitive Instruments. The Model 5000 Phase Standard contains an Autozero function which measures the output phase at ±90° and makes an internal correction to remove any phase errors between the two output channels. The Autozero operation, which takes less than 0.25 sec., is activated automatically each time an amplitude or frequency is changed. It may also be activated manually. Both output sinewaves are generated digitally with the result that the basic parameters of Phase and Frequency require no adjustments to maintain their superior accuracy. Only the output amplitudes are adjustable. The extremely low output impedance of the Model 5000 Phase Standard coupled with its ability to Autozero with an external load in place, makes the phase accuracy of the instrument completely insensitive to loading. The Model 5000 Phase Standard has an internal SELF TEST capability which checks the output frequency for all frequency ranges, checks all of the digital sine wave generation circuitry, checks the output levels of all amplitude ranges for both channels and checks the Autozero function. The complete set of specifications of the Model 5000 Phase Standard may be checked with an accurate ac/dc (true rms) Multimeter, an accurate Frequency counter, a good Distortion Analyzer and the Clarke-Hess Model 5002 Phase Verification Bridge Set. This completely passive bridge set may be sent either to Clarke-Hess or directly to NIST for annual recertification. Many of the adjustments for the internal potentiometers in the Model 5000 Phase Standard are included in an internal calibration routine. If adjustment is required during annual recertification, the operator just turns the "pot" until a value indicated on the display is obtained. The ability to operate the instrument over the IEEE-488 interface makes other adjustments equally straight forward.